This column was written by The Early Show co-anchor Harry Smith. The Republican presidential candidates debate tonight in South Carolina — the second scrum in what is shaping up to be a too long run for the White House. Some are saying tonight's performance is crucial for Rudy Giuliani. Rudy leads the pack in many polls. He's viewed around the country as a hero of 9-11 — as America's mayor. The soothsayers, though, say he needs to buff up those credentials tonight so religious conservatives might consider giving him a pass on issues like abortion and gay rights. If primary voters want to know what New Yorkers think of Rudy they might want to consider taking a look at a poll released this week by the New York Daily News. It's current mayor, Michael Bloomberg, they think is not only a better mayor, but says the poll, would make a better president, too. 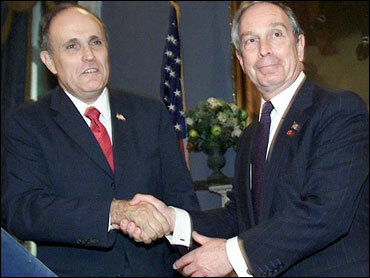 Mayor Bloomberg says he's not running, but he acts like he is. Yeah Rudy has worries about the religious right, but the mayor right behind him might pose an even bigger threat.